For most of us, the first time out of the US is usually somewhere nearby – Canada, Mexico – or somewhere popular in Europe – France, England, etc. On my first day of teaching the business seminar with RELUFA, I met two girls from the US. One of them is still in high school, and it was her first trip out of the US! I was amazed! Apparently Patience (the girl’s name) had wanted to go somewhere that spoke French, and her dad knew the person running the church mission here in Cameroon so there she was for 2 and a half weeks. The poor girl was stuck in Yaoundé the whole time. I can only imagine the culture shock she was experiencing. 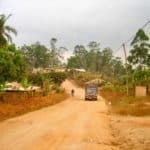 So during the week, I took her to lunch, showed her the Peace Corps compound, and experienced a bit of Cameroon that she wouldn’t have experienced. On the last day, she was brave enough to try poisson braisé (grilled fish)! Bless her heart, it was her first time “eating fish that looks like a fish”. I suppose that means with the fish head and all. Beside the “wild” adventures, Patience asked me plenty of questions about life as a Peace Corps volunteer and life in village. I was more than happy to answer her questions. The questions ranged anywhere from “what made you decide to join the Peace Corps?” to “how long did it take you to learn how to cross the street?” Through answering them, I realized how much I’ve grown through this experience thus far. Explaining to someone from the US about my life here reinforced my decision to challenge myself and have wild stories to tell. I hope I didn’t scare the girl too much with my ridiculous stories and maybe someday she’ll become a Peace Corps volunteer herself! Goal 3 of the Peace Corps – checked.